LARRY BUNDY was raised on a grain and livestock farm in southern Illinois (Monroe County). He attended public elementary and secondary schools, and received B.S. and M.S. degrees from the University of Illinois. He served in the U.S. Army from 1969 to 1971. In 1973, he received a Ph.D. degree in soil chemistry from Iowa State University. From 1973 to 1982, Larry worked in industry as a soil scientist for Libby, McNeill and Libby and Nestle Enterprises, Inc. He joined the Soil Science faculty at the University of Wisconsin-Madison in 1982, where he was a Professor and Extension Soil Scientist for 25 years until retirement in 2007. Larry conducted research and educational programs on understanding and managing soil and fertilizer nutrients in crop production while minimizing nutrient losses to the environment. His work has emphasized nitrogen and phosphorus management for agronomic and environmental benefits, and he has authored over 80 research publications and over 250 Extension articles. 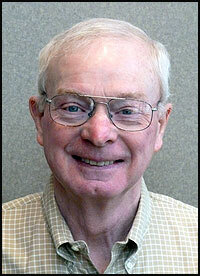 Larry is a fellow of the American Society of Agronomy and the Soil Science Society of America. He is also a Wisconsin Certified Soil Scientist. In retirement, Larry enjoys fishing, gardening, and reading mystery novels. Swimming, weight lifting, and walking are his favorite fitness activities. He also continues to write for scientific journals. Larry and wife Susan enjoy travelling, spending time with children and grandchildren, attending Badger basketball home games and attending concerts including the Madison symphony. Larry passed away on July 8, 2013.